Free screening mammograms are available during the month of May on campus thanks to a partnership with UT Southwestern Medical Center in Dallas. The screenings are free for UTA faculty and staff with the UT Select medical plan. Employees without the UT Select plan can call to verify that their medical plan is accepted. Most medical insurance plans cover screening mammograms at no cost. 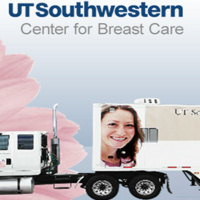 UT Southwestern’ s mobile mammogram unit will provide screenings by appointment 8:00 a.m. - 3:00 p.m. Friday, May 18, outside of College Park Center at Gate #1, at Spaniolo Drive and Third Street. Women are encouraged to begin annual screenings at age 40. To schedule a mammogram appointment, call 214-645-2560 or 866-277-0710. For more details call the Office of Human Resources at 817-272-5554. College Park Center, At Gate # 1 - At Spaniolo Drive and Third St.